Neil Gelston finished as Armagh's top scorer in the weekend reverse. Waringstown chased down 208 in a rain-affected 25-over Premier League game against North Down at The Lawn with four balls to spare. Ryan Haire got the visitors off to a great start, getting to his 50 in the 14th over as North Down sat 100-1, with Alistair Shields also at the crease and ticking along nicely. When Kyle McCallan bowled Haire for a well-made 59 from 49 balls, it brought Ruhan Pretorious to the crease, who alongside Shields went about posting a very competitive total. Shields brought up his 50 from 34 balls in the 20th over with his side sitting on 148-2 and eventually ended up on 83, with Pretorious going big in the last couple of overs to finish 43 not out and set Waringstown a tricky total to chase down. As is standard procedure this season, Waringstown got off to a good start through Adam Dennison and James Hall with the pair reaching their 100 partnership in the 12th over - and Hall brought up his half-century an over later from 37 balls. When Dennison was dismissed for 49, the Villagers required 88 from 63 balls and when Pretorious struck twice in an over to get rid of Hall (75) and captain Greg Thompson, the home side were 148-3 from 18 overs with a further 60 runs needed. Lee Nelson played an important role as he ended 27 not out to see his side home and earn what could prove to be a crucial four points come the end of the season. Also, CSNI picked up their first league win of the season, with Andre Malan hitting his second century in as many games and Marc Ellison also getting 98 at the top of the order. Set a total of 259 to win by Carrick, with Ian Parkhill (51) and Hornbuckle (61) the main contributors, CSNI lost Andrew Cowden early, who was caught behind off the bowling of Martin. 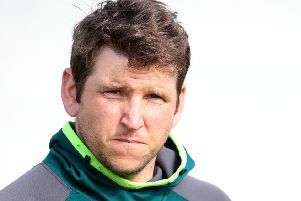 Malan and Ellison proceeded to put on a partnership of 182 for the second wicket, and Ellison was denied a century as he was caught by Jamie Holmes from the bowling of Ryan Eagleson. Malan continued to press on and was on 107 when he was caught and bowled by Alex Haggan, with CSNI also losing Morgan Topping (0) and James Kennedy (2). Chris McMorran played a vital innings, scoring 31 not out as he guided the Stormont side to a four-wicket victory and their first of the 2018 season. Instonians also stayed within four points of the league’s summit with a five-wicket win over Muckamore at Moylena. Set a total of 179, Nikolai Smith hit 82 and Jordan McClurkin struck 37 as they breezed to the total and kept themselves in the hunt for a second title in three years. Following Saturday’s play, Waringstown hold top spot in the Robinson Services Premier League standings with four wins from five fixtures. CIYMS and Instonians shared second spot on 12 points apiece.